A banker catalogues America’s wealthiest men and women. Former Goldman Sachs partner Smith believes that the years 1980–2000 will mark the greatest period of wealth creation in American history. His analysis of the men and women who have generated that prosperity begins with the annual Forbes magazine list of the country’s 400 wealthiest people, all of whom are now worth over $600 million. Smith points out that remarkably few of the families on the list are “old money,” and he breaks down the nation’s super-rich into five general categories: entrepreneurs, dealmakers, investors, tycoons, and entertainers. 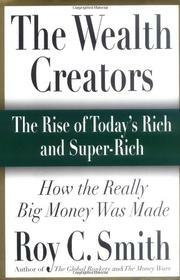 He outlines how the members of each of these groups made their money, alternating short biographical sketches with easy-to-swallow explanations of such topics as the junk-bond market, the structure of the NFL, and Warren Buffett’s value-oriented style of investing. All in all, it reads like a research report written by a Wall Street investment bank for its retail customers, with individuals substituted for companies. Some financiers and executives are lionized in the glowing terms usually reserved for Intel and Cisco, while others are downgraded over concerns about recent market performance. (This point is driven home, somewhat ingeniously, by the cover design, which shows famous names coursing across the page like symbols on a stock ticker.) As is often the case with stock analysts’ reports, there are no shocking insights here, but the prose is compulsively readable and the analysis, though intentionally superficial, is rock solid. Analysis can have a short shelf-life, though, and the recent stock-market plummet has already made some of it obsolete. But Smith’s main point—that stakeholders almost always make more money than employees—transcends the market’s periodic mood swings. People magazine for the mutual-fund set.